Yesterday, more than 17,000 readers ran through 88,000 page views, and posted about 1,100 comments, according to a new Google Analytics report. That’s according to a new Google Analytics report (image, left), which I’m posting because several readers asked about traffic yesterday, the day Gannett launched its big newspaper layoff. Pay survey: How much does Gannett pay you? Traffic fell last month from August’s impossible-to-sustain levels. Unique visitors (why that’s a tricky metric) totaled about 25,000 vs. nearly 29,000 the month before. Visits totaled about 101,000, down from 118,767. 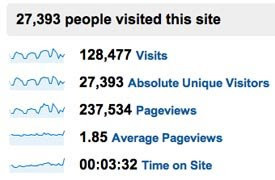 And page views fell to 207,480 from a steep 273,112. And now, context! Gannett employs about 46,000. 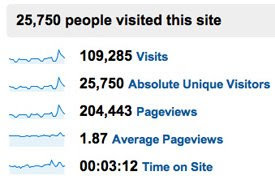 Plus, media industry-leading blogger Jim Romenesko nabs 100,000 individual visitors a day. Updated at 5:44 a.m. ET, Sept. 1. News drove traffic sky-high this month — to levels I doubt can be sustained, a new Google Analytics report says. Unique visitors in August jumped 66% from July, to nearly 29,000 (why that metric is tricky). Visits rose 59%, to about 119,000. And page views soared 90%, to about 273,000. For context: Gannett employs about 46,000. 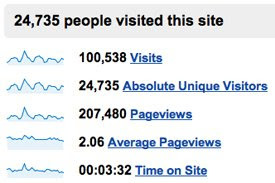 And industry-leading blogger Jim Romenesko nabs 100,000 individual visitors a day. “What do you do when a blogger becomes the chief source of information about what’s going on inside your company for employees of that company? That’s the conundrum that’s facing Gannett these days, as Jim Hopkins‘ independent Gannett Blog has apparently gone viral. 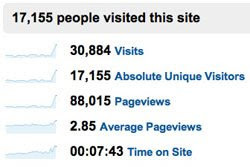 Hopkins reveals some recent traffic statistics: 91,000 visits and 189,000 page views in the last 30 days. 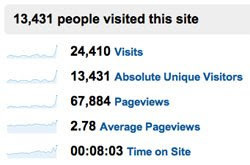 That’s serious blog traffic, folks. What’s more, the site is being swarmed by Gannett employees. It’s become the virtual watercooler for a company of 46,000 people. “The conundrum for Gannett is what to do about Hopkins. So far, it’s chosen a strategy of benign neglect, which is a huge mistake. Hopkins remarks that Tara Connell, Gannett’s chief spokesman (and interestingly, a former managing editor at USA Today) has gone almost silent recently as rumors have swirled about layoffs and cutbacks. Meanwhile, check out the volume of comments on each post on the blog. Gannett’s strategy (and we suspect this isn’t Connell’s decision) is about as wrong-headed as it could be. It is allowing a brush fire to grow out of control. What’s worse is that it’s failing to address an important channel to its own employees, who are the most valuable spokespeople it has. 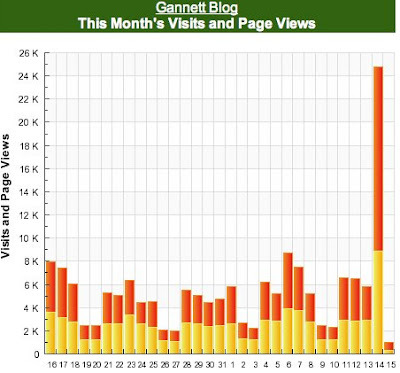 Reader: How was Friday’s Gannett Blog traffic? Answer: Traffic eased a bit from Thursday, when Gannett disclosed massive layoffs in its newspaper division. Still, yesterday’s figures continued to be more than three times above average. 1. You mention you know Gannett Corporate knows about your blog and watches it. Can you give me any evidence of this? Have you ever received direct feedback from anyone in Corporate? All of my official, on-the-record correspondence with Gannett Corporate has been through the company’s chief spokeswoman, Tara Connell. You can see our last exchange here. The most direct feedback I’ve received from Connell was in the form of her objections to the first of a series of posts about the Gannett Foundation. 2. Why did you decide to write a blog exclusively about Gannett (well, with asides for wonderful tidbits about Spain and Sparky). I have been a business reporter for most of the 22 years I’ve been a journalist — 20 of them with Gannett. In October 2006, I noticed two things. One, very few news outlets covered Gannett, even though it’s the biggest newspaper publisher, and one of the nation’s largest private employers (approximately 46,000 workers.) Second, there wasn’t a single blog about Gannett, even though it was about to undergo big changes as it dealt with more competition from the Internet and other venues. “Rumors flew that Gannett was planning to sell us to the competition, or dump us into a joint-operating agreement. More than 700 employee families were desperate for information. As the paper’s business news editor, I managed some of the newsroom staffers reporting on the Gazette‘s demise. We called Gannett’s Corporate office, pleading for information, over and over. And again and again, we got this: No comment. Bottom line: I started Gannett Blog so employees would have a safe place to share information about the company, without fear of reprisal from management, as they prepared themselves for a vastly changed industry. 3. Do you see your blog as having a shelf life with an expiration date, or do you see it going on as long as there are news corporations? To put it another way, if Gannett breaks up, will you still write about the biz? I’ve written that I only plan to keep Gannett Blog about two or three years — as long as the company remains substantially in its current form. That said, year No. 3 would start this coming October. If Gannett is dramatically re-shaped, I will stop blogging about the company. 4. How do you address the issue of disloyalty — or do you? You took their check, and I am sure were a great employee. Now you’re a fill-in-the-blank backstabber (I get “bitter” a lot). Or does any of this apply? Are YOU bitter? Or is this just fun? I’ve never addressed the notion of disloyalty because it’s never been an issue for me. I neither hate nor love Gannett. I do, however, care deeply for its front-line, hourly employees, many of whom are also small stockholders. 5. What is your readership/impact? 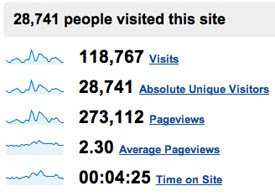 In July, the most recent period for which I’ve reported traffic statistics, I had about 17,500 unique visitors; approximately 75,000 visits, and about 144,000 pageviews. That is according to Google Analytics, an online software program that measures such figures. Company co-founder Frank Gannett (left) would not be amused! 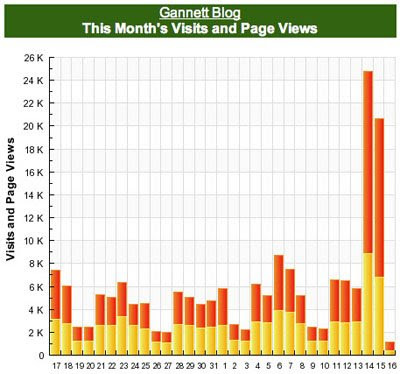 Gannett Blog grabbed nearly 9,000 visits and 25,000 page views yesterday — more than three times’ the daily average — as the company hacked off 1,000 jobs from the newspaper division. New to this blog? Please take the “Where do you work survey,” near the top of the blue sidebar, right. You are currently browsing the archives for the Traffic reports category.